This entry was posted in Crochet, Diary of a Crafty Fairy!, Making Stuff and tagged crochet, Simply Crochet Cowl Neck Poncho by patchworkfairy. Bookmark the permalink. Fingers crossed those injections provide some much needed relief. I love your poncho, I think just the one pink layer makes it stand out some more. 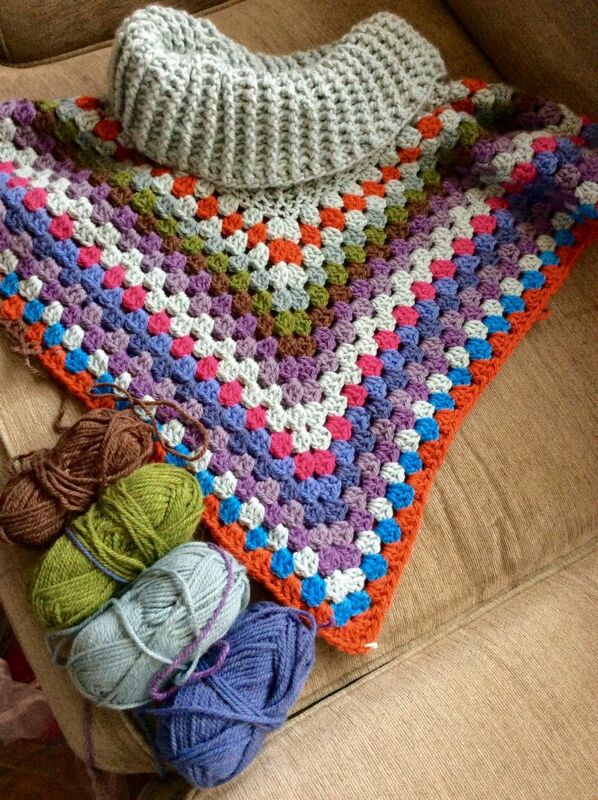 Your poncho is coming along wonderfully, I love all the colours. I really looking forward to seeing it completed. Good luck with your hospital visit I hope it leaves you pain free. After the brown, do the pink, then the green [I like the green] – both of those colours will compliment the pink properly and soften the tone toward the edge of your poncho. As, if it “pops” too much, the “eye” will go straight to the “border” [to stay] and not to the “body” of your work. Anyhoo, GOOD LUCK with the “Good”-Drugs! The poncho is fantastic. Hope the injections go okay and help you in the end. I hope the injections help you. I am no stranger to joint pain, it’s miserable and I really feel for you. Your poncho looks lovely. I bet it’ll keep you nice and warm.